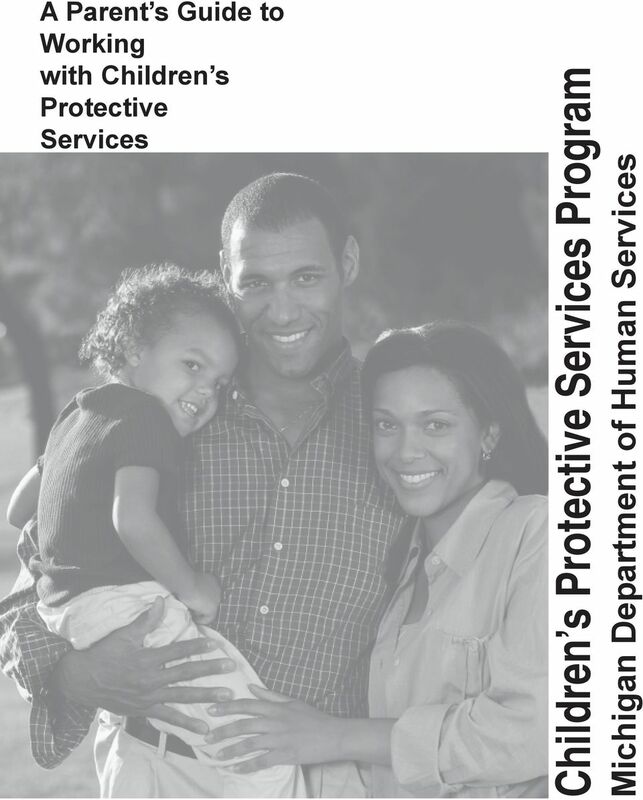 Download "Children s Protective Services Program"
2 Dear Parent: We know that every parent wants to do the best they can for their child and we also understand that being a parent is hard work. Every parent has strengths and challenges that they face. 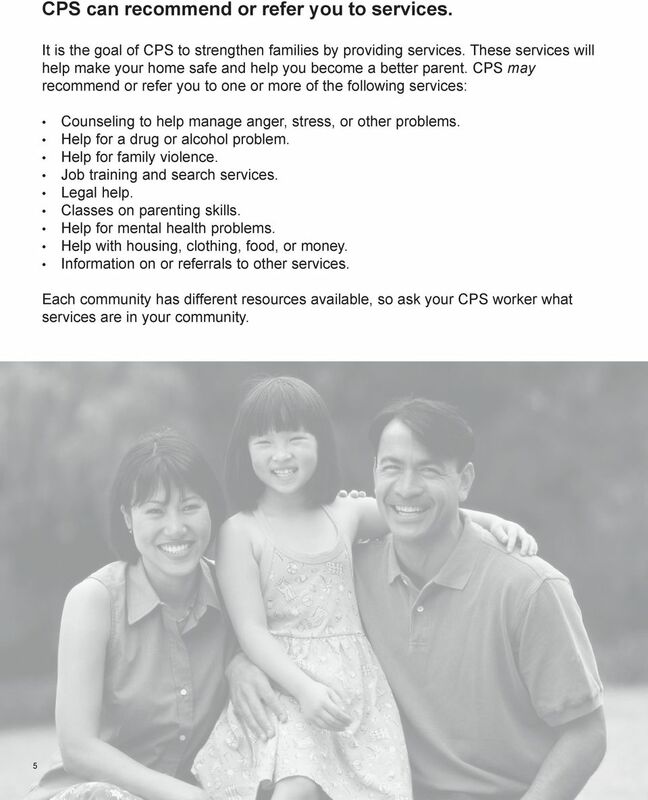 Child Protective Services (CPS) hopes to work with you to build on your family s strengths and get you what you need to overcome challenges. 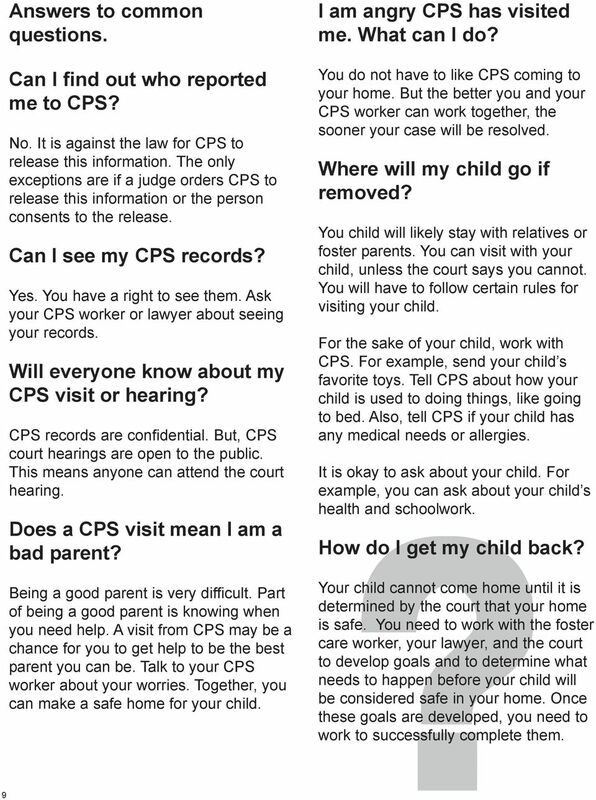 We understand that being visited by CPS can be overwhelming. It is normal to feel upset or confused. 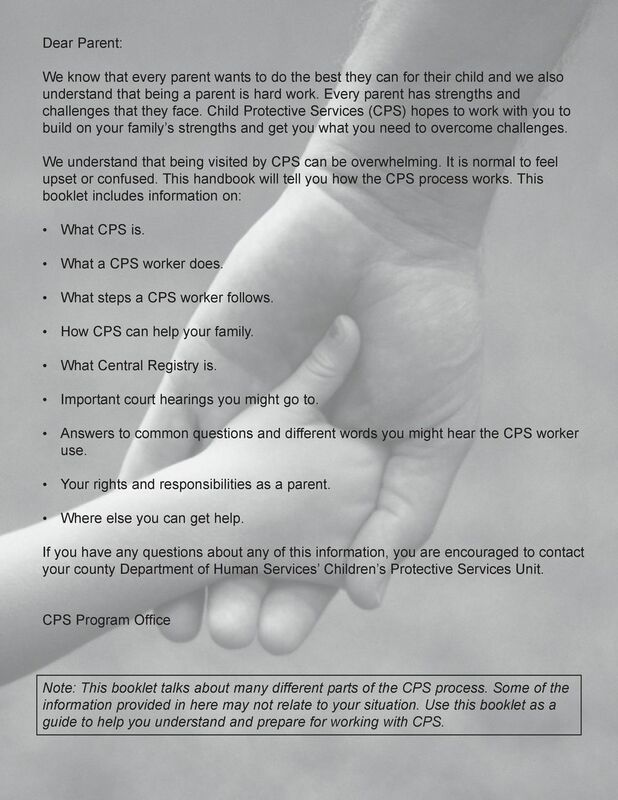 This handbook will tell you how the CPS process works. 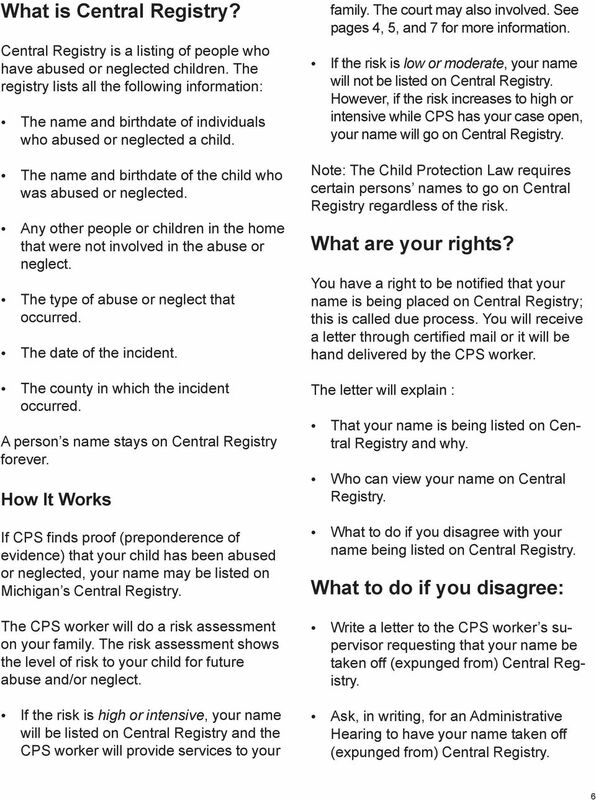 This booklet includes information on: What CPS is. What a CPS worker does. 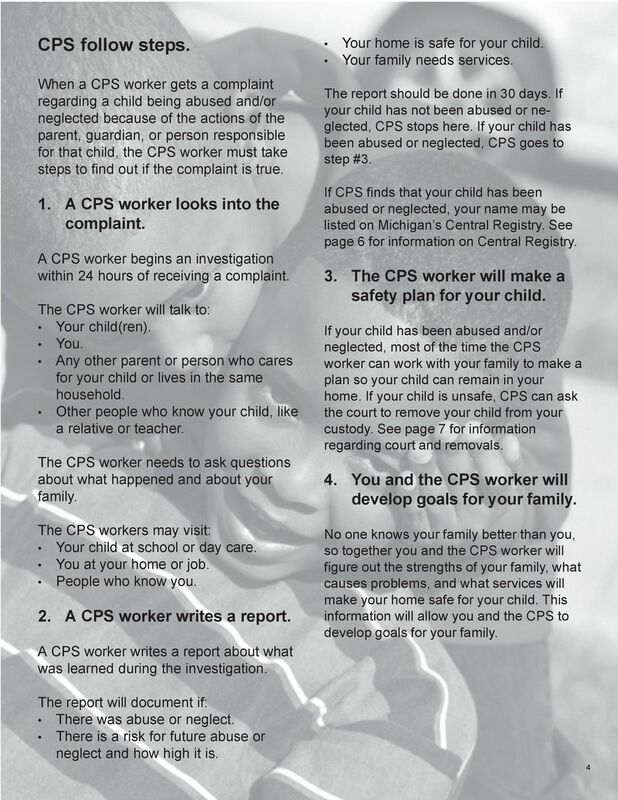 What steps a CPS worker follows. 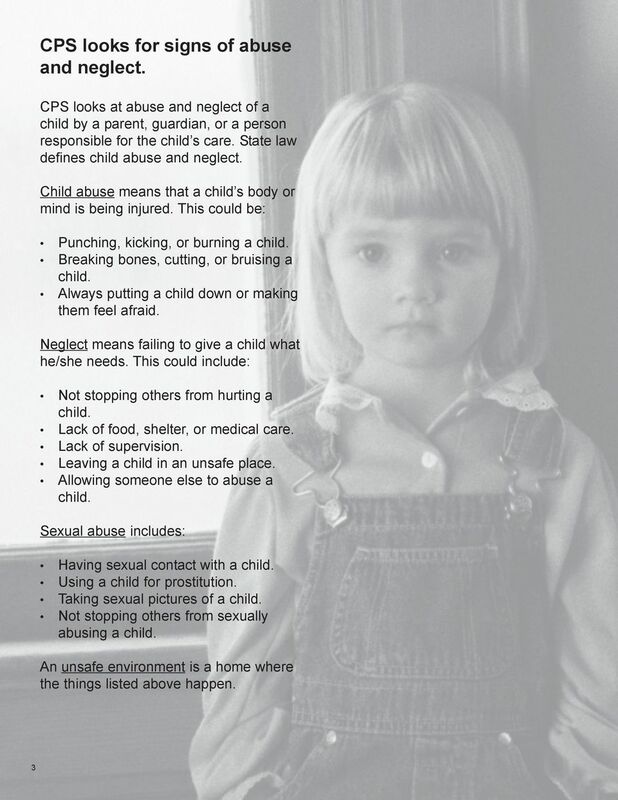 How CPS can help your family. What Central Registry is. 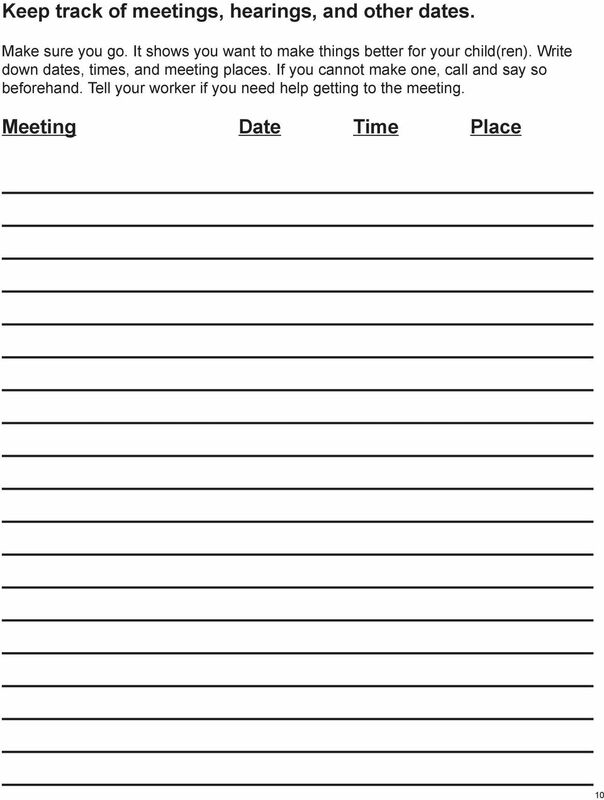 Important court hearings you might go to. 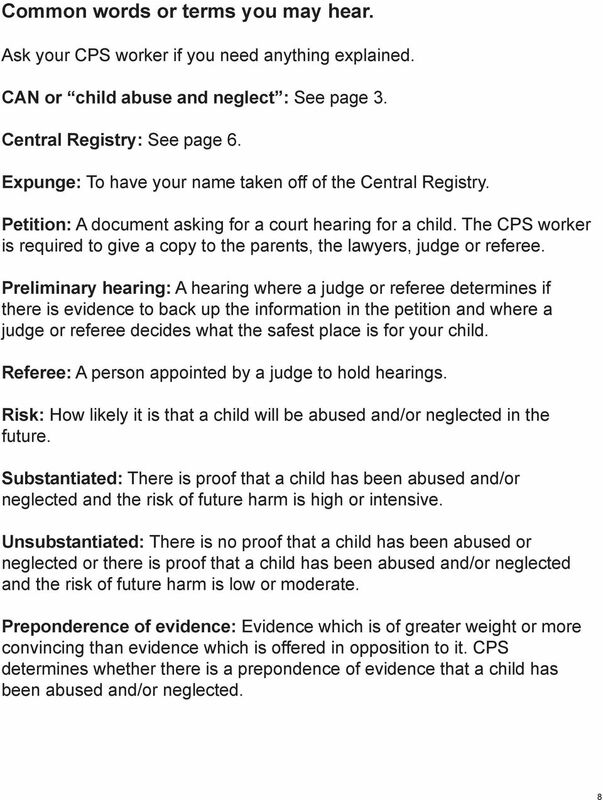 Answers to common questions and different words you might hear the CPS worker use. 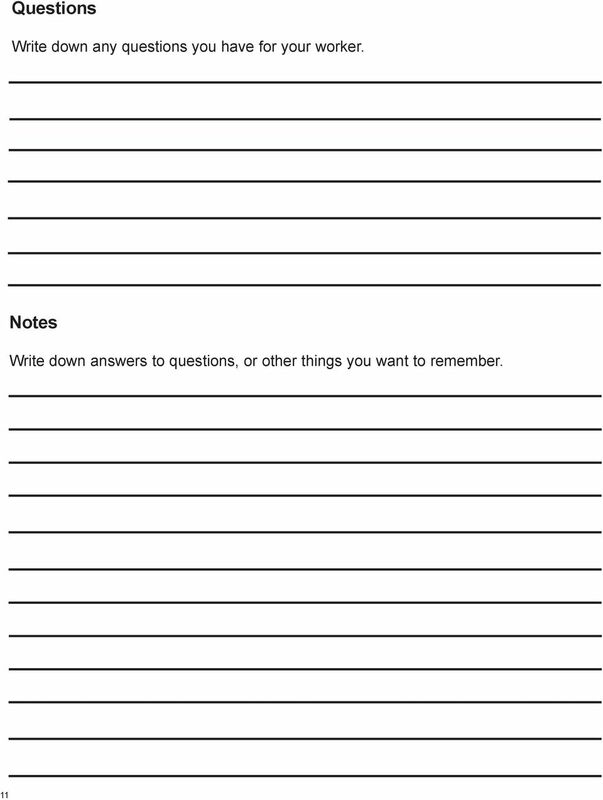 Your rights and responsibilities as a parent. Where else you can get help. 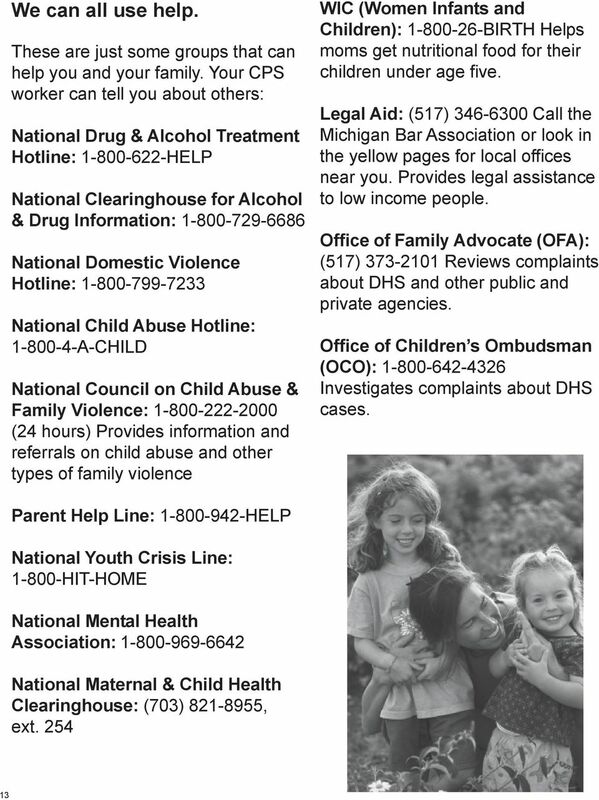 If you have any questions about any of this information, you are encouraged to contact your county Department of Human Services Children s Protective Services Unit. 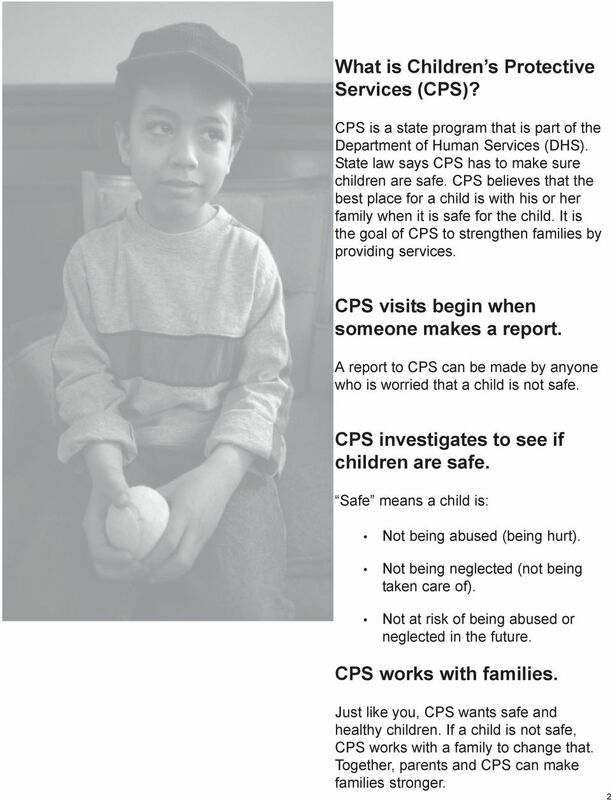 CPS Program Office Note: This booklet talks about many different parts of the CPS process. Some of the information provided in here may not relate to your situation. 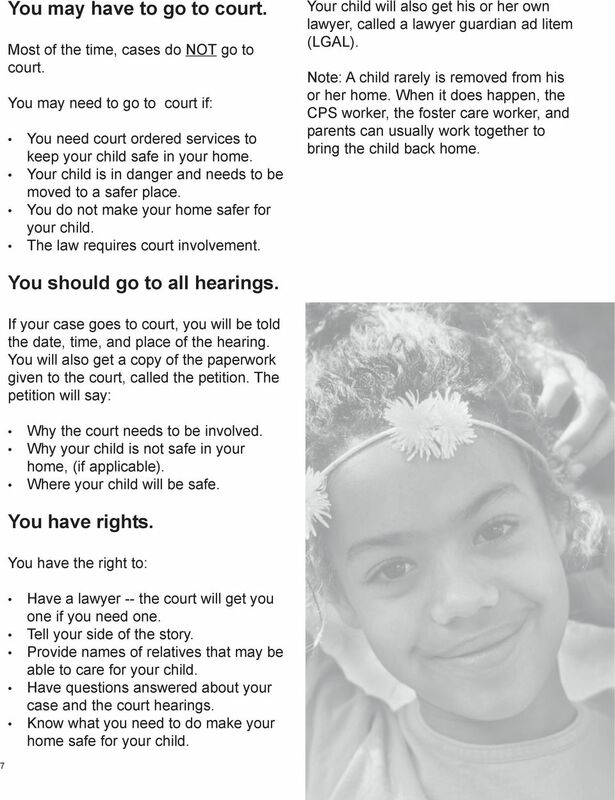 Use this booklet as a guide to help you understand and prepare for working with CPS. 8 You may have to go to court. Most of the time, cases do NOT go to court. You may need to go to court if: You need court ordered services to keep your child safe in your home. Your child is in danger and needs to be moved to a safer place. You do not make your home safer for your child. The law requires court involvement. Your child will also get his or her own lawyer, called a lawyer guardian ad litem (LGAL). Note: A child rarely is removed from his or her home. When it does happen, the CPS worker, the foster care worker, and parents can usually work together to bring the child back home. 7 You should go to all hearings. If your case goes to court, you will be told the date, time, and place of the hearing. You will also get a copy of the paperwork given to the court, called the petition. The petition will say: Why the court needs to be involved. Why your child is not safe in your home, (if applicable). Where your child will be safe. You have rights. You have the right to: Have a lawyer -- the court will get you one if you need one. Tell your side of the story. 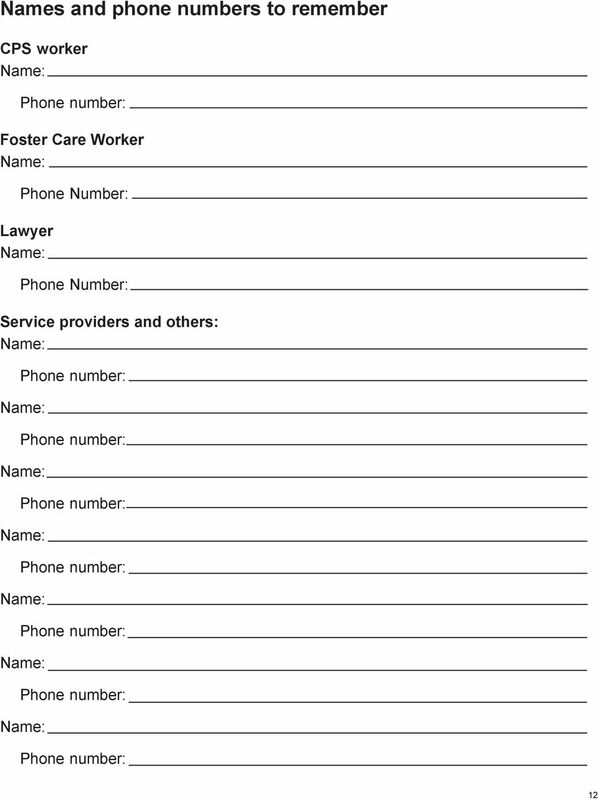 Provide names of relatives that may be able to care for your child. Have questions answered about your case and the court hearings. Know what you need to do make your home safe for your child. A Handbook for Parents & Guardians in Dependency Cases Case No. : Being involved in a dependency case can be very confusing and stressful for a family. Not knowing what to expect can make it even harder. Getting From Here To There A Guide to The Dependency Court For Children and Youth in Foster Care January 2007 Dear Youth in Foster Care, This Guide has been reviewed by youth in foster care for your benefit. When you file a custody action, the courts will generally determine both legal custody and physical custody.